By Len Kravitz, Ph.D and Lance C. Dalleck, M.S. What are the physiological limitations of the human body? How much more are you capable of doing? The curiosity and complexity of solving these questions have led to a plethora of research investigations on human potential. Much about the mystery of muscular strength is just now being unraveled with the advances in genetics research and will be the topic of a future article. However, a clearer picture of the bodys physiological limitations to endurance exercise is better understood. Whether you are a world-class athlete or a recreational runner, your capacity for endurance exercise has similar physiological limitations. Endurance exercise can be defined as the ability to perform cardiovascular exercise, whether it be cross-country skiing, spinning, running, aerobic exercise or swimming, for an extended period of time (Robergs & Roberts 1997). One is limited in this pursuit by a complex integration of multiple physiological functions. Despite the multifaceted nature, endurance exercise is characterized by one simple requirement  the necessity to sustain repeated muscle contraction. This criterion is fulfilled through two basic functions  the ability to consume enough oxygen and an adequate fuel provision. The capacity for oxygen consumption is reliant upon the physiological parameters of maximal oxygen uptake, lactate threshold, and economy of movement in the given activity. Fuel, or food substrate, is supplied mostly through carbohydrates and fats. Hydration levels and genetic factors also play influential roles in the capacity for endurance exercise. This article will review the main physiological mechanisms limiting endurance exercise and performance. Maximum oxygen uptake (VO2max) refers to the highest rate at which oxygen can be taken up and consumed by the body during intense exercise (Bassett & Howley 2000). Traditionally, the magnitude of an individuals VO2max has been viewed as one of the most important predictors of endurance performance. A classic study, conducted in the 1970s at Ball State University, confirmed the importance of VO2max to endurance performance with findings indicating a strong correlation between VO2max and 10-mile run times (Costill 1970). Prolonged exercise requires sustained energy provision to maintain muscle contraction and is accomplished through the continual production of ATP (adenosine triphosphate), the universal energy molecule. The production of ATP is accomplished through three metabolic pathways (breakdown of a fuel to release energy), which include the phosphagen system (the production of ATP from creatine phosphate), glycolysis (glucose breakdown), and mitochondrial respiration (aerobic metabolism within the mitochondrion of the cell). The first two pathways are only capable of energy production for short durations; consequently, ATP regeneration for extended exercise is accomplished predominantly through mitochondrial respiration. The biochemical reactions involved in mitochondrial respiration depend on continuous oxygen availability for proper functioning. Enhanced oxygen delivery and utilization during exercise will improve mitochondrial respiration and subsequently the capacity for endurance exercise. Both central (heart, lungs, blood vessels) and peripheral (tissue extraction of oxygen) physiological functions can limit VO2max. The relative importance of each function in limiting endurance performance has been discussed, researched and debated by exercise physiologists for decades. The ability of the cardiorespiratory system to transport oxygen to the exercising muscles refers the central component of VO2max (Roberts & Robergs 1997). The role of the central component is for oxygen to be transported from the atmosphere and delivered to the muscles where it is utilized during mitochondrial respiration to produce ATP. The main central limitations to oxygen delivery are pulmonary diffusion, cardiac output, and blood volume and flow (Bassett & Howley 2000). The lungs serve a primary function of transferring oxygen from the atmosphere to the blood, and for the removal of carbon dioxide from the body. Pulmonary ventilation, or breathing, is the movement of air into and out of the lungs. Pulmonary diffusion is the exchange of oxygen and carbon dioxide between the lungs and the blood. In normal individuals, pulmonary diffusion is not a limiting factor to VO2max. However, in well-trained endurance athletes, with much higher cardiac outputs (which is the product of heart rate and stroke volume), pulmonary diffusion may become a limiting factor to VO2max. The very high cardiac outputs that highly trained athletes attain shortens the time period for blood to pick up oxygen in the lungs, possibly leading to lower blood oxygen saturation levels (Robergs & Roberts 1997). Despite this possibility, pulmonary diffusion is thought to play a minor role in the overall limitation of oxygen delivery for endurance performance. Cardiac output (defined above as the product of heart rate and stroke volume which is reported in liters per minute) is commonly identified as one of the main limiting factors to oxygen delivery and VO2max (Bassett & Howley 2000). In fact, some researchers have concluded that 70-85% of the limitation in VO2max can be attributed to maximal cardiac output (Cerretelli & DiPrampero 1987). A persons maximal heart rate is quite stable and remains unchanged with endurance training. Maximal heart rate is much more dependent on a persons age, decreasing as one ages. Contrariwise, stroke volume (the amount of blood pumped per heart beat) increases substantially from endurance training. Much of this rise is due primarily to the increased chamber size and wall thickness of the left ventricle (the hearts hardest working chamber because it pumps blood throughout the body). However, from endurance training, both the left and right ventricles have expanded capacity to fill with blood. The heart, being a muscle with the ability to extend, also attains a greater stretch from the increased blood volume, which results in a stronger elastic recoil for ejecting the blood to the body tissues. The variation in individual maximal stroke volume explains most of the range observed in VO2max in trained and untrained individuals. During incremental exercise to maximal, untrained individuals experience a plateau in stroke volume at an intensity approximately 50% VO2max, whereas with highly trained endurance athletes, stroke volume continues to increase up to VO2max (Robergs & Roberts 2000). This allows for further increases in cardiac output and improved endurance performance. Working muscles demand considerably more oxygen and nutrients. To meet these needs, more blood must be allocated to the muscles during endurance exercise. The final link in the oxygen delivery chain (from the lungs and heart) is the oxygen carrying capacity of the blood. Oxygen is transported in the blood bound to a molecule called hemoglobin located within red blood cells. Regular, intense endurance training will increase blood volume via two mechanisms: 1) an increase in hormones (antidiuretic hormone and aldosterone) causes the kidneys to retain water, increasing blood plasma (fluid portion of blood), and 2) a boost in plasma proteins production also leads to more blood plasma (Wilmore & Costill 1999). This increase in fluid reduces the bloods viscosity. A reduced viscosity may improve blood flow through the blood vessels, especially the smallest vessels which will enhance oxygen delivery to working muscle mass (Wilmore & Costill 1999). An increase in red blood cell volume is also possible with endurance training (not consistent with every person), which could lead to an additional increase in the bloods oxygen carrying capacity. Research has shown increasing the number of red blood cells in the body through blood infusions concurrently increases VO2max values by 5 to 10% (Gledhill 1982; Spriet, Gledhill, Froese, & Wilkes 1986). It is important to add that during intense endurance exercise the body redistributes blood flow to the metabolically active skeletal muscles, readying the tissues for extraction of the needed oxygen. To briefly recap all of the above, oxygen delivery to muscles during endurance exercise may be limited by central factors including pulmonary diffusion, maximal cardiac output, and blood oxygen carrying capacity (volume and flow). Despite the apparent central limiting factors to VO2max and endurance exercise, research has also suggested the influence of peripheral limiting factors, which is where we now shift our focus. The ability of exercising muscles to extract and utilize oxygen, which has been transported by the cardiorespiratory system, refers to the peripheral component of VO2max (Robergs & Roberts 1997). The potential sites for VO2max limitation in the peripheral component include muscle diffusion capacity, mitochondrial enzyme (molecules that facilitate ATP production in mitochondria) levels, and capillary density (Bassett & Howley 2000). A pressure gradient (difference) existing between the blood and muscle cells allows for the transportation of oxygen from the red blood cells into the mitochondria. Oxygen utilization and continued mitochondrial respiration rely on the maintenance of this gradient. Endurance training results in a two-fold increase in mitochondrial enzymes levels (which allows the working muscles to use more oxygen), resulting in a higher VO2max, and also indicates this potent peripheral limitation to VO2max (Honig, Connett, & Gayeski 1992). In addition, a 20% increase in capillary density (the anatomical location of oxygen exchange between the blood and muscle) has also been reported with endurance training, signifying an improved distribution and extraction of blood within the muscle (Robergs & Roberts 1999). Which is More Crucial to VO2max: The Central or Peripheral Component? It is intriguing to note that although the average increase in VO2max is 15% to 20% (person sedentary prior to training), increases up to 93% have been reported in the literature (Wilmore and Costill 1999). Although most current research supports the central component to be the main limitation to VO2max (Wilmore and Costill 1999), the importance of peripheral components to VO2max should not be minimized. However, due to the logistical constraints of studying the consumption of oxygen at the cellular level, at highly intense levels, the entire picture of oxygen utilization is still developing (Robergs 2001). The term economy is used to express the oxygen consumption required to perform a given exercise workload, whether it be spinning, running, or any other endurance activity (Daniels 1985). Differences in oxygen consumption between individuals at similar exercise workloads illustrate the individual variation found in exercise economy. Consequently, individuals with similar VO2max values can have much different endurance performances depending on their economy of movement. In fact, high correlations between 10-km running performance and economy have been reported between runners with comparable VO2max values (Conley & Krahenbuhl 1980). Individual exercise economy is enhanced with endurance training and has been explained by improvements in biomechanical techniques in performing the specific physical activity (Roberts & Robergs 1997). The lactate threshold refers to the intensity of exercise at which there is an abrupt increase in blood lactate levels (Roberts & Robergs 1997). Many scientists consider the lactate threshold to be a primary indicator of endurance performance (Wilmore & Costill 1999). Additionally, the lactate threshold (compared to VO2max and economy) appears to be the most responsive physiological parameter to endurance training (McKardle, Katch, & Katch 1996). In untrained endurance individuals, the lactate threshold occurs at approximately 50-60% of VO2max. Following endurance training, individuals generally improve the lactate threshold to 75% of VO2max; with values at 80-90% of VO2max having been reported in elite, world-class endurance athletes (McKardle, Katch, & Katch 1996). The performance benefit of this training adaptation is that an individual is capable of maintaining a higher steady state exercise intensity (below the lactate threshold) during the endurance exercise. This allows the endurance exerciser to maintain faster steady state tempos during training or racing, leading to improved endurance performance. In fact, research has consistently reported high correlations between the lactate threshold and performance in a variety of endurance events including running, cycling, and race-walking (McKardle, Katch, & Katch 1996). It has been proposed that the best predictor of endurance performance is the maximal steady state workload achieved near VO2max (Weltman 1995). To better understand and appreciate the lactate threshold, a physiological explanation describing its mechanism is warranted. The primary pathway for ATP regeneration during endurance exercise is mitochondrial respiration, which initially shares the same metabolic pathway as glycolysis, where muscle glycogen (glycogen is the store form of glucose in muscle or the liver) or blood glucose is converted into another chemical molecule called pyruvate. Depending on exercise intensity, pyruvate will either enter the mitochondria or be converted to lactate. At exercise intensity levels below the lactate threshold, pyruvate enters the mitochondria and muscle contraction continues through oxidative ATP production. However, at exercise intensity levels above the lactate threshold, the capacity to produce ATP through mitochondrial respiration is compromised, and pyruvate is converted to lactate. The metabolic pathways supporting exercise intensity above the lactate threshold are only capable of sustaining muscle contraction for short durations, thus limiting endurance activity (Bassett & Howley 2000). The physiological explanations for lactate threshold improvements following endurance training are related to increased mitochondria size, numbers, and enzyme levels. Following endurance training, mitochondria size and numbers have been reported to increase by 50-100%, thus increasing the mitochondrial respiration capacity (Holloszy & Coyle 1984). Additionally, the previously mentioned 2-fold increase in mitochondrial enzymes will also enhance mitochondrial respiration capacity. The combined result of these adaptations is a delayed timeline to lactate threshold and greater capacity to perform endurance exercise. The potential for endurance performance according to the physiological parameters we have examined thus far is limited by the complex interaction of VO2max, economy, and lactate threshold. An individual would achieve their endurance potential by maximizing their physiological capacities in each of these components. In an effort to investigate the endurance potential of humans, researchers have input VO2max, economy, and lactate threshold levels into theoretical models to predict the ideal performance for a marathon (Joyner 1991). These models suggest an endurance runner with a VO2max of 85 ml/kg/min, a lactate threshold of 85% VO2max, and an ideal running economy would be able to maintain a marathon pace of 21.46 km/hr. These optimal performances in each physiological component would result in an amazing time of 1:57:58 (hr:min:sec), which is nearly 8 minutes faster than the current world record. Thus far, we have focused on the metabolic machinery (VO2max, economy, and lactate threshold) necessary for endurance exercise and performance. However, the ability to exercise for extended periods requires not only adequate metabolic machinery but also fuel (food substrates) for continual muscle contraction. The human body is dependent on fats (lipids), and carbohydrates (blood glucose and muscle glycogen) to support ATP regeneration for sustained muscle contraction (Roberts & Robergs 1997). Availability and utilization of these substrates plays a significant role in the limitations to endurance exercise. The intensity of endurance exercise regulates the substrate utilized for the provision of energy. During low-intensity endurance exercise (<60% VO2max), fats and carbohydrates are used to support metabolism. With increasing exercise intensity (at or above 70% VO2max), there is a shift towards more carbohydrate metabolism to support continuous exercise (Roberts & Robergs 1997). While carbohydrate substrate supply is limited, lipid supply in most individuals is unlimited. After approximately 2 hours of intense steady state exercise, muscle glycogen stores become significantly depleted resulting in fatigue, regardless of the presence of an adequate oxygen supply. Research has demonstrated that the ingestion of carbohydrates during exercise can prolong the duration of exercise beyond the time supplied by muscle glycogen stores (Coggan & Coyle 1989). When muscle glycogen stores are exhausted, individuals experience fatigue and muscular pain. In marathon running, this physiological event is commonly referred to as hitting the wall. One of the most noted physiological adaptations to endurance training is an increased reliance on fats at the same relative intensity workload. This carbohydrate sparing modification increases an individuals potential for endurance activity and performance at lower intensity (<60% VO2max) endurance exercise. However, regardless of training status, at exercise intensities nearing lactate threshold, there is a greater predominance of carbohydrate utilization for substrate supply because the metabolism of carbohydrates (resulting in the formation of ATP) is more efficient with regards to the oxygen consumption (Robergs & Roberts 1997). Most endurance competitions are performed at intensities near the lactate threshold in which substrate utilization relies almost entirely on blood glucose and muscle glycogen. Long-term training in multiple endurance sports including cycling, running, and swimming has been shown to increase muscle glycogen levels (Robergs & Roberts 1997). This training adaptation extends the duration and intensity of the endurance exercise prior to muscle glycogen depletion, and subsequent fatigue becomes prolonged. Since the 1960s, research has indicated a modified diet strategy, known as glycogen supercompensation (commonly referred to as carbohydrate loading), used in the week preceding endurance events could enhance muscle glycogen stores. The approach calls for the individual to train intensely while maintaining a low-carbohydrate diet early in the week, thus depleting muscle glycogen stores. Later in the week, the individual decreases training intensity and consumes a high-carbohydrate diet  resulting in enhanced muscle glycogen stores. Unfortunately, this practice, though effective, is also mentally and physically demanding for the individual. More recent research has determined that simply following a higher-than-normal carbohydrate diet the week prior to competition (>70% carbohydrate) sufficiently increases muscle glycogen stores (Robergs & Roberts 1997). In ultra-endurance events in which the exercise intensity (<60% VO2max) is far below the lactate threshold, the primary substrate utilized becomes fats, which are circulating in the blood (known as Free Fatty Acids or FFAs) or stored within the muscles (intramuscular lipids). During these activities, the energy supply provided by lipids is virtually inexhaustible in most individuals. Consequently, the limitation to performance in these longer, lower intensity events is the result of physiological mechanisms other than substrate supply and oxygen availability, and may be the product of muscle damage. Sweating is a normal physiological response to prolonged exercise, required for the dissipation of heat produced during energy metabolism. Unfortunately, this natural occurring response can also result in substantial fluid loss and impaired endurance performance. Inadequate fluid balance throughout prolonged bouts of exercise or training sessions results in several deleterious physiological events including increased heart rates and temperatures. Research has suggested that rising body core temperatures may cause fatigue in the muscles (by impairing mitochondrial respiration) and central nervous system (Fitts 1994). Dehydration also results in higher heart rate values for the same submaximal intensity due to decreased stroke volumes, resulting from the lower blood plasma volumes. It is possible for heart rate values to approach maximal levels despite the submaximal nature of endurance exercise during severe dehydration (Roberts & Robergs 1997). Although dehydration is a naturally occurring physiological limitation to endurance exercise, it can be countered to a certain degree by adequate hydration practices both prior to and during endurance exercise. Currently, there are many different approaches and products used by endurance enthusiasts for pre-exercise and exercise hydration, including the ingestion of solutions comprised of water, salt, simple carbohydrates, electrolytes and glycerol. The physiological limitations to endurance exercise examined thus far including VO2max, economy, lactate threshold, substrate availability/utilization, and hydration may all be influenced by another factor: genetics. Various researchers have reported a genetically regulated upper limit to individual VO2max values (Bouchard et al 1999). These findings indicate that regardless of training volume or intensity, 10-30% of the variability in VO2max is genetically determined. The genetic influence on VO2max has been attributed to both central and peripheral factors with the genetic effect on cardiac output having been reported to be as high as 50% (McCardle, Katch, & Katch 1996). Similarly, training improvements in economy and lactate threshold are parameters that are also genetically regulated. Genetic differences in muscle fiber type proportion (slow-twitch and fast-twitch) are also commonly found in individuals. Slow-twitch muscle fibers, characterized by more mitochondrial mass and enzyme levels than fast-twitch muscle fibers, have an increased capacity for mitochondrial respiration. Elite endurance athletes generally possess high percentages of slow-twitch muscle fibers in muscles contributing to their respective endurance exercise. In fact, elite marathoners have been reported to have greater than 90% slow-twitch muscle fibers in muscles of the leg (Costill, Fink, & Pollock 1976). The advantage of more slow-twitch muscle fibers includes greater mitochondrial capacity, increased oxygen consumption, and increased performance in endurance exercise. High correlations between slow-twitch muscle fibers and endurance performance have been reported in both running and cycling (Costill, Fink, & Pollock 1976, Ivy et al 1980). Individual fiber type proportions also genetically regulate the training adaptability to the physiological parameters of VO2max, economy, and lactate threshold (Robergs & Roberts, 1997). The purpose of our article was to review the major physiological limitations to endurance exercise. Though the physiological mechanisms regulating endurance performance are quite complex, the main factors limiting prolonged exercise have a straightforward interpretation. To continue exercise for extended durations, sustained muscle contraction must be maintained and is dependent on the continuous provision of both oxygen and fuel. Although each of the physiological limitations is modifiable through endurance training, it is important to recognize that genetic factors play a tremendous role in the trainability of these limitations and their capacity. It is therefore critical for coaches, fitness instructors, and personal trainers to recognize the all of the physiological components limiting endurance performance as they design exercise programs to improve endurance capacity. 1. Bassett, D.R., JR., & Howley, E.T. 2000. 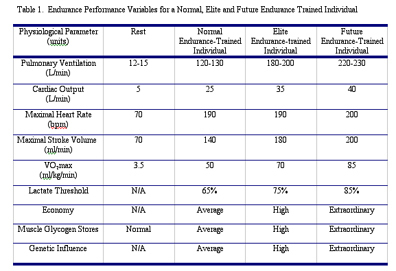 Limiting factors for maximum oxygen uptake and determinants of endurance performance. Medicine and Science in Sport and Exercise, 32(1), 70-84. 2. Bouchard, C., An, P., Rice, T., Skinner, J.S., Wilmore, J.H., Gagnon, J., Perusse, L., Leon, A.S., & Rao, D.C. 1999. Familial aggregation for VO2max response to exercise training: results from the HERITAGE Family Study. Journal of Applied Physiology, 87, 1003-1008. 3. Cerretelli, P., & DiPrampero, P.E. 1987. Gas exchange in exercise. In: Handbook of Physiology. A. P. Fishman, L.E. Farhi, S.M. Tenney, & S.R. Geiger (Eds.). Bethesda, Maryland: American Physiological Society, 297-339. 4. Coggan, A.R., & Coyle E.F. 1989. Carbohydrate ingestion during prolonged exercise: effect on metabolism and performance. Exercise and Sport Science Reviews, 19, 1-40. 5. Conley, D.L, & Krahenbuhl, G. 1980. Running economy and distance running performance of highly trained athletes. Medicine and Science in Sport and Exercise, 12, 357-360. 6. Costill, D.L. 1970. Metabolic responses during distance running. Journal of Applied Physiology, 28, 251-255. 7. Costill, D.L., Fink, W.J., & Pollock, M.L. 1976. Muscle fiber composition and enzyme activities of elite distance runners. Medicine and Science in Sport and Exercise, 8, 96-100. 8. Daniels, J. 1985. A physiologists view of running economy. Medicine and Science in Sport and Exercise, 17, 332-338. 9. Fitts, R.H. 1994. Cellular mechanisms of muscular fatigue. Physiological Reviews, 74(1), 49-94. 10. Gledhill, N. 1982. Blood doping and related issues: a brief review. Medicine and Science in Sport and Exercise, 14, 183-189. 11. Holloszy, J.O., & Coyle, E.F. 1984. Adaptations of skeletal muscle to endurance exercise and their metabolic consequences, Journal of Applied Physiology, 56, 831-838. 12. Honig, C.R., Connett, R.J., & Gayeski, T.E.J. 1992. O2 transport and its interaction with metabolism: a systems view of aerobic capacity. Medicine and Science in Sport and Exercise, 24, 47-53. 13. Ivy, J.L., Withers, R.T., Van Handel, P.J., Elger, D.H., & Costill, D.L. 1980. Muscle respiratory capacity and fiber type as determinants of the lactate threshold. Journal of Applied Physiology, 48, 523-527. 14. Joyner, M.J. 1991. Modeling: optimal marathon performance on the basis of physiological factors. Journal of Applied Physiology, 70, 683-687. 15. McArdle, W.D., Katch, F.I., & Katch, V.L. 1996. Exercise physiology: Energy, nutrition, and human performance. Baltimore, Maryland: Williams & Wilkins. 16. Powers, S.K., Lawler, J., Dempsey, J.A., Dodd, S., & Landry, G. 1989. Effects of incomplete pulmonary gas exchange of VO2max. Journal of Applied Physiology, 66, 2491-2495. 17. Robergs, R.A. 2001. An exercise physiologists contemporary interpretations of the ugly and creaking edifices of the VO2max concept. Journal of Exercise Physiology online, 4(1), 1-44. 18. Robergs, R.A., & Roberts, S. 1997. Exercise Physiology: Exercise, performance, and clinical applications. St Louis, Missouri: Mosby. 19. Robergs, R. A. & Roberts, S. 2000. Exercise Physiology: For fitness, performance and health. Boston, Massachusetts: McGrawH-Hill. 20. Spriet, L.L., Gledhill, N., Froese, A.B., & Wilkes, D.L. 1986. Effect of graded erthrocythemia on cardiovascular and metabolic responses to exercise. Journal of Applied Physiology, 61, 1942-1948. 21. Weltman, A. 1995. The blood lactate response to exercise. Champaign, Illinois: Human Kinetics. 22. Wilmore, J. H. & Costill, D.L. 1999. Physiology of sport and exercise. Champaign, Illinois: Human Kinetics.